First made in 1899 by a German brewer living near Mexico City, the name was inspired by the sunlight flooding the old brewery. Pale gold and light, with a sharp and refreshing bitter edge, it's very dry and cool. Perfect served ice cold with a twist of lime as an apéritif, with ceviche or grilled fish. The Authentic Mexican Beer Since 1899. 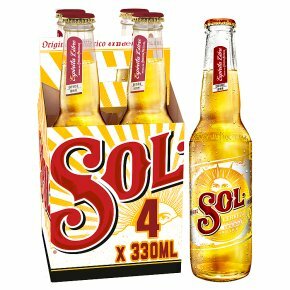 Beer brewed with sun, passion and soul for a great refreshing taste. A delicate flavour combining cereal notes with a subtle, sweet bubblegum fruitiness. A very drinkable lager that does what it's designed for, to be enjoyed ice cold in the sun with friends. Put a lime wedge in the top of the bottle and it's the perfect BBQ accompaniment. ABV: 4.5% Aroma Fast and crisp with hint of bubblegum sweetness. Flavour: Corn chips with hints of lemon and bubblegum fruitines. Mouthfeel: Lightly sweet, delicate cereal and fruit notes. Finish: Light with husky crisp dryness. Food Match: BBQ nachos. Serve chilled. Put a lime wedge in the top of the bottle and it's the perfect BBQ accompaniment.